A PROJECT that began life as a hospital radio station has grown to be highly regarded as a community broadcaster and is looking to take another major step forward, writes Paul Macdonald. "We are looking to create a media training centre and to move the community radio station down to Kingdown School," said Barry Mole, station director at Warminster Community Radio. 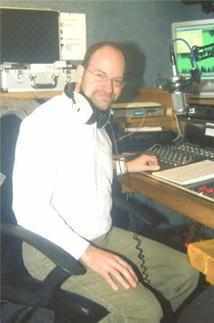 The station has grown from its early beginnings in cramped conditions in The Athenaeum in 1996 broadcasting to local hospitals. It caught the public imagination when it gained a special licence to broadcast live to the public for 28 day spells from it current home at the Assembly Hall. It has added more and more listeners by transmitting to local schools and charities. "We will have the radio station and a lot more," said Mr. Mole explaining the ambitious ideas. "There will be a sound, stage and recording studio." "Pupils and schools in the area and locals interested in media studies will all be able to use it." The studios have more than a dozen experienced presenters fronting a wide range of choices for listeners and they have even come to the attention of pop star Sting. They include well-known local musician Chico Holton's 'Roots and Roll' show to Heather Robinson's 'Radio Therapy' who wanted 'to hear Springsteen played more often on the radio'. This week the plans arrived at the planning authority in Trowbridge for permission to set up at Kingdown School which will bring a whole host of benefits to a wide range of people. The district council are hoping to have an answer sometime in March. Pictured: David Cox at the studio controls during his Sunday Showcase programme which airs between 5pm and 7pm on Sunday.